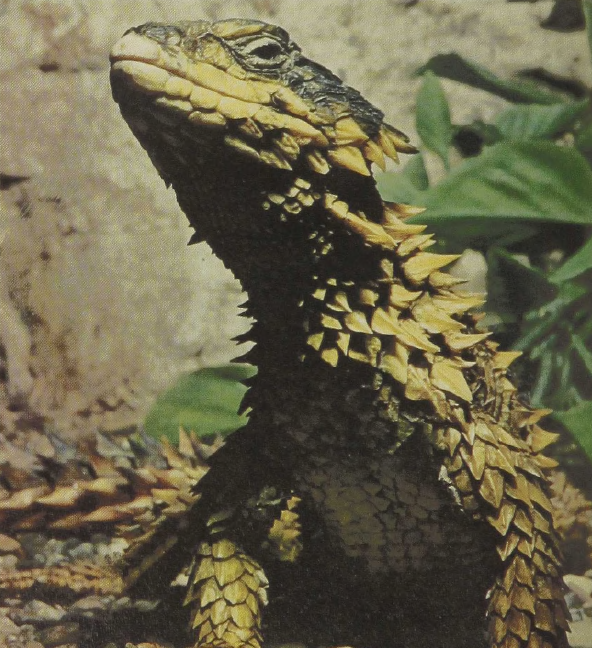 This club-tailed lizard of southern Africa is the largest member of its group, reaching about 15 inches in size. Its head is spined, the back plated, and the tail covered with rings of half-inch-long bone-cored spines. Only the belly scales are unprotected; when threatened, these animals will stretch out on the ground holding the limbs against the sides and vigorously resisting any effort to turn them onto their back. The closely related Armadillo Lizard does the Sungazer one better- by rolling up into a ball when disturbed: whichever way one rotates the ball one encounters only the spiny armor. All of these lizards are live-bearers, giving birth to two 5-inch-long young at a time. Sungazers are carnivores.